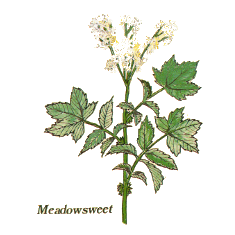 Meadowsweet grows in damp woodlands and marshbeds. It grows about 1m tall with fernlike like leaves, reddish stalks and dense clusters of creamy white almond scented flowers which bloom June to September. Useful in the relief of indigestion and heartburn. it contains the same ingredient as willow bark from which aspirin was developed and so may be useful as a mild analgesic. Meadowsweet, water mint and vervain were three herbs said to be sacred to the Druids and have been found in bronze age burial cairns. 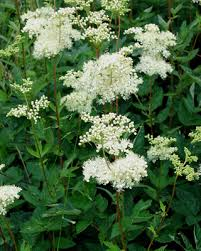 It was known as bridewort because the fragrant flowers were strewn along church aisles for brides to walk along-they were thought bring love and a happy marriage.